\r\nAfter spending so much time vacationing on “Island Time”, I can see why people sell everything and move down there My retirement fantasy is to sell EVERYTHING, move to the Caribbean and work at Dive Shop or be a handyman! \r\nMy pictures start on page 4, and I hope to post each evening (when I have internet access). \r\nGene (Moody Blue) & Janet Larsen from Iowa and have flown EVERY trip with me! \r\nTen planes are starting out April 9th from Homestead to vacation on Grand Turk and one more RV will join the group on Grand Turk on April 13th. There is a chance my skypark neighbors Doug & Gail Dodson may join us for a short time as they are flying to Brazil so Doug can land his Glasair below the equator (with Sharkbait). \r\nFrom Grand Turk, four RVs will depart on April 12th and continue to the British Virgin Islands (BVI), Dominican Republic, Curaçao, Bonaire, Grenada and up the Lesser Antilles Island chain for ONE BIG MONTH-LONG LOOP around the Caribbean! I\'m thinking we may take a day while in the BVI to clear Customs back to the USA at St. Thomas, and island-hop the USVI and Puerto Rico "just because it would be fun"! \r\nIf you are flying, fly safe! \r\nPS: Planning will start during this trip for Cayman Islands/Belize 2015! \r\nUpdate: We completed the trip and arrived home safely on May 5th after flying 9405 nautical miles over 70 hours with landings on 23 islands Read on to see how much FUN we had! Sorry I\'m missing this one. First one since last trip to the Turks! \r\nYou will probably be in a rush to get home and not have the timing right, but the Central Texas Airshow will be ongoing at Temple (TPL) on Sat, 4 May. Falcon Flight will be performing. Drop in before TFR and enjoy the show. \r\nWishing we were on your wing again for the trip. \r\nYou guys have fun and be safe. \r\nFrom Rosie: Jim "Jimmyb" Baker thought it best that I get out on my \'own\' now that I\'m all growed up. Seismo is in training for next Ironman! \r\nIf you\'re over southwest MS around shut down time, drop in on T-36 we got cheap 100LL, ground transportation, close motel, and no fees. Hey Rosie, you guys need to do a couple flybys next week, I should be on a dive boat somewhere off Provo in T&C! \r\nFrom Rosie: Jim, let me know what side of the Island you might be on come Tuesday morning! I have thought about doing this kind of a trip in my 8. Are you able to load up a raft and jackets along with your gear and 2 pax? My thoughts are "where do I put the raft so that I can get it out if I ditch the airplane"? \r\nSounds like a great time and I will be following you! Rosie, you rock man. Keep us posted! \r\nWhat do you need for entry? Passport or $$$$. \r\nThe biggest flight challenge will likely be just getting to florida. \r\nWe are southbound to the SW in a few weeks. Count me and Diane in 2015. \r\nHope to see Scott and Tanya as they pass through here this weekend. Bon voyage, my friend. It doesn\'t look like you\'ll be stopping at Sun \'n Fun. Do it, Rosie! Why wait? I\'ll buy your -6 for Tyson (which was his first RV ride), so we\'ll have a way to get to the islands, you\'ll have a dusty couch we can sleep on when we visit, and I\'m sure you\'ll be eager to give us your best discount on SCUBA rentals. \r\nTravel safely, friends. Your trip reports always keep us motivated in the shop! Cards are launching this Saturday. First stop is to see the mighty Horton, then Asheville, then on to Homestead on Monday. Let the adventure begin! bon voyage to you all!! a trip of a life time. keep the pics and videos coming. \r\ni just returned from the virgins last week and the wx was the best ever. the best part is you dont need to pack much cloths. \r\nif anyone needs to deviate to stuart you know you are welcome to spend the night. \nCount me in for 2015. I love the Caribbean. Leaving for Cruise tomorrow out of San Juan. One of the stops is Barbados. Love that place. \nHad a job offer about 10 years ago there and almost took it. Now I have no ties and make take a look to see if there are any tour operators needing a helicopter pilot. \nThere is serious money to be made!!! \r\nI would stop at 2J9 (Quincy) instead of TLH while in north Florida. It will be much cheaper to buy fuel and no ramp fees, etc. watson.david@ccbg.com if I can help. Sherri and I are bummed to be sitting this trip out, but as it turns out we would have had to cancel at the last minute regardless. Her mom had to have unexpected spinal surgery 4 days ago with 10 1/2 hours in the OR. Not a chance Sherri would have left her. \r\nHeads up Rosie and Chris... I was at my hangar yesterday changing the tires on my plane when I saw the BH (Big Hammer) in one of the drawers in my tool box. Before we left Grand Exuma in 2011 Chris Kleen asked me to carry it home because he was severely weight restricted. I hope you have accounted for the BH sitting this trip out. \r\nSo keep checking in, and we\'ll be following along here with interest as well as a tad bit of envy. Everybody be safe and have a fantastic trip. Can\'t wait for some of the pictures to start coming in. Moody Blue (Gene and Janet) will be launching out of Atlantic, IA, stopping for fuel in Kennet, MO and Headland, AL (this could change) and RON at Ft Myers, FL on Sunday. Looks like about 7 1/2 hours flight time. \r\nMight meet up with John and Dani there. We just need to know when to meet at Marathon for lunch on Monday before heading up the Keys to Homestead. \ngreat write-up, excellent photos, and wonderful adventure! . Thanks for sharing it with us. \nP.S. 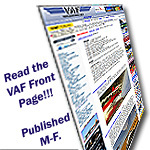 I don\'t know what the VAF record is for most viewed thread, but this one is already over 3,900 and the main part of the trip hasn\'t even begun yet. Hard 8 is in my book! What happens if you don\'t put the big n numbers on the aircraft? \r\nFrom Rosie: You could be fined by Customs....I don\'t want to \'test\' them! How are you handling the luggage/bags issue? Just travelling light, or shipping some stuff in/out? \r\nFrom Rosie: We had about 20 lbs between our legs between the battery box and fuel selector, steel stakes along the floor rails at our feet, and the BH stuffed in the gear leg weldment. I have all my dive gear, clothes and tools in back. My clothes weighed 10 lbs but with the computer and other \'stuff\', the bag came in at 28 lbs. \r\n	Greg Niehues - PPSEL, IFR, Repairman Cert. You guys all ROCK! I spend way too much time drooling over all the pictures and stories you post (this is the first thing I read when I turn on my computer at work....then spend as long as it takes reading every detail of your trip - maybe if I spend more time actually working, I could afford an RV and take an adventure with you....someday). Godspeed to you all!